Dear tacogirl, I find your articles to be very interesting and would like to offer a different perspective on this topic for your consideration. We have traveled between Belize and Canada for years. Canada is a wonderful place to live and so is Belize. While in Belize, we prefer to purchase local brands of products because we find them to be comparable or better quality and far less expensive. It is also notable that many of the imported brands in Belize contain far less chemicals than the Canadian or US version of the same brand. In Belize, there is an abundance and wide variety of fresh food that is available year round and very reasonably priced so we purchase very little canned, frozen or processed foods and find it very easy to eat a healthy diet. We find the meat in Belize to be of exceptional quality. Four quarter chickens usually cost about BZD$6.00 or USD$3.00. A fresh whole chicken usually costs about BZD$10.00 or USD$5.00.Â A five pound roast of beef or pork usually costs about BZD$35.00 or USD$17.50. One pound of Organic Coffee usually costs BZD$14.00 or USD$7.00. Pure Orange Juice (not from concentrate) usually costs BZD$13.50 or USD$6.75 per Gallon. 5 gallons of Agua Dolce Water (delivered to your door the same day you order it) costs BZD$5.00 or USD$2.50 not including the refundable bottle deposit. Blanca Nieves Laundry detergent costs BZD$6.00 or USD$3.00 per Kilogram. We find rent and electricity to be about the same price as in Canada depending on where you live. Water and cable TV rates are very reasonable. Gasoline is more expensive in Belize but vehicle insurance is very reasonably priced. We have found the education, medical and dental services in Belize to be excellent. In our experience, importing items from the USA, even after paying for shipping plus Belize duty and taxes, is still less expensive than making the same purchase in Canada for equal or better quality. There are a wide range of restaurant prices but typically lunch for two costs about BZD$25.00-$50.00 or USD$12.50-$25.00. The people of Belize are extremely friendly and level of customer service provided in Belize is absolutely outstanding. I agree with you that the very best way to find out what Belize is like is to come for a visit but once you’ve experienced life in Belize it can be very hard to get back on the plane to go home. Great Blog tacogirl!!! Keep up the great work!!! Please note – A memorial service for Maria Antonia Plaza Gomez will be taking place this afternoon at 3:00 pm on the Beach just south of the Belize Yacht Club. Ebay has lots of coddlers Bob – hope you have good luck finding better ones. It is actually Rick and Leona [are you thinking of Tim and Tina at invest in Belize?]. I did not know that they sold Real Estate here as far as I know they somehow tied into the Health industry. I’ll see if I can find you a pair. I bought the white ones from Amazon; they will work but they are crummy. The male screw threads are glued to the coddler, and of course, using glue that melts. I’m in the market for better ones and if I can find tsome I’ll bring you a couple down at the end of this month. Hmm…those eggs are sounding pretty good Bob. I may have to get an egg coddler too. I eat lots of egg whites. That sounds delicious – I could also go for crumbled bacon with a hint of maple syrup. Now you have me wanting an egg coddler – I will go check ebay. Will check price on those if I see them Debra. I found some great onion crackers here and they are cheap too. I use crock pot so that helps for keeping heat down. It is perfect baking weather today though. Ah…I love crackers too Laurie..I would really miss my wheat thins. Yes about the ground steak, but here again, there are differences in preference. Fat gives the taste to meat, and that is one of the big problems with Belize beef….no fat. We find we like ground beef (at Linos) rather than ground steak, which they sell at both places. To make good spaghetti sauce and meat loaf, we use half and half ground beef and ground pork. Forget the big cuts of meat because fat also contributes to tenderness when you cook roasts and steaks. Bz beef is OK for braising, but for the most part it’s too hot to make a braised dish, unless you have a crock pot…and many do! coddled eggs are great! I have a source for free range chicken eggs which have way more flavor than supermarket ones. you put one or two eggs in the coddler and whatever other ingredients you want screw on the lid and put them in an inch or two of boiling water for 8 minutes. the little ring on top helps you pick them up without getting burned but I would like to have a porcelain lid though.you eat them right out of the coddler so they stay good and hot. Maybe some stilton cheese and crumbled bacon mmmm…..
ha ha special moment – it was ecstasy. Coddled eggs is a new one to me – I looked up egg coddlers and I now know I have seen one before. http://www.egg-coddlers.com/introduction.shtml I have seen a flowered one with a metal lid like the top picture – personally I like the design of the second one better with the porcelain lid and chicken picture. Hi Ron I will put you in touch with Leona by sending her your email. I love anything to do with Belize. Also read your post every time and enjoy it a lot. My wife and I have been to Belize twice this year and are planning for a multi month stay in the new year as I am going to retire in August. Do you think I could get in touch with Leona Simoes? Thinking of staying in Sarteneja or there a bouts. Scrambled eggs with Stilton. That would be ecstasy! Oh my I think I just had a special moment!LOL I recently discovered coddled eggs and had been planning to bring a couple of egg coddlers because the eggs at La Provedencia have great taste. Stilton will definitely be an ingredient now! I miss crackers – have found some at reasonable price here but that is one thing that does not store as well here due to the humidity. Maybe I need to keep them in the fridge lol. I made tasty scrambled eggs with Stilton before. The cheese selection is better at Wine DeVine than any I have seen here in the states. Just bring your own crackers, they cost more than the cheese!LOL Of course they cost like that in any store in San Pedro.I love me some english stilton. It stinks so good! Love Flor too! 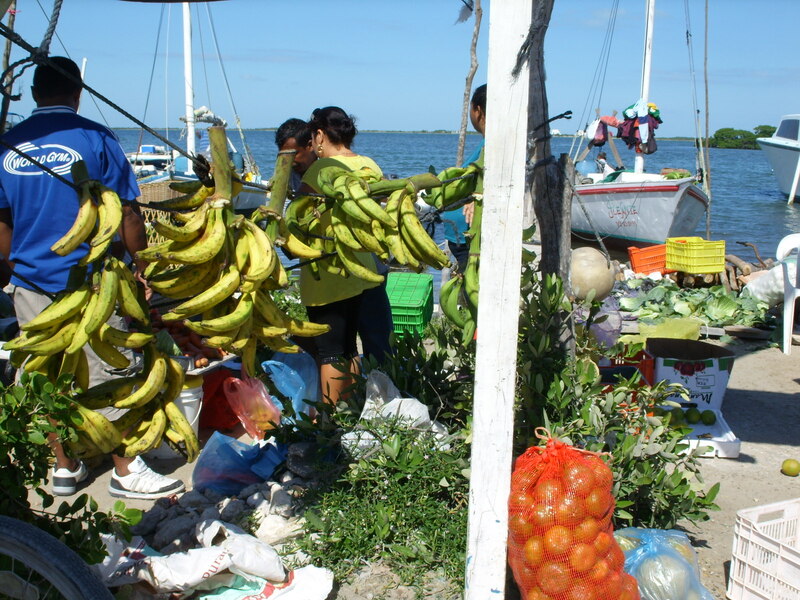 The market is in town towards the lagoon side of the island. Check out my maps page https://tacogirl.com/san-pedro-belize-map/ and look for Sunset Grill on the map the market is to the left of that. Early to mid morning is better for selection. We passed by around 10am and there was a lot of stuff there as you can see from the pics. When we went back around noon on our way home there was a lot less. I think they may be there Thursdays too but I have not checked that lately. If I find out for sure will let you know. Gwen I saw a good price on large size All detergent 100 oz or 2.96 L for 22.07 tax included. Have you tried Sausage Factory ground steak? It is really nice. Heard the new butcher does a decent t-bone too. Thanks Tim. I miss living in the apartments above Mickeys – that is a great price on lunch for four people. I just wanted to let you know that I really enjoyed your Cost of Living and the Cost of Living follow up. There were great posts with super valuable information in them. Keep pumping out the good stuff. Where is this market you show in your photos? What do they usually have available for sale there? What time do you need to go to get good selection? I agree with Ms. Leona for the most part, that it is great to buy the local items of quality. But, if you buy the local TP you won’t like it, day in and day out. Also the laundry detergent isn’t a good buy in the long haul because you need to use twice as much. For us coffee snobs there isn’t any coffee here worth buying. The list Laurie put together reflects things expats want to buy. Pork and chicken here are great, but the beef is subjective. Ground beef is fine, but when you go to buy a good cut of beef, often if it is good it is from the US. Canadians and Americans might seem like they might be similar, they are. But, there are some big differences between Canadians and Americans. We don’t agree on coffee, beef, and probably some unexpected other things. I really liked these two posts , very informative. Leona Simoes knows Belize , like I do . We had lunch at an air-conditioned restaurant (Mickey’s) and it was 55 bucks BZ 4 people . Tina and I had the fish and toss salad and they had similar . We always get great service and I was thrilled at the cost .